Flora Belle Buckman is what her mother calls a natural-born cynic. As the child of divorced and somewhat eccentric parents, Flora spends a lot of time in her room reading her favorite comic book, The Illuminated Adventures of the Amazing Incandesto, much to her mother's chagrin, as she thinks Flora should be reading real literature. One day, Flora notices something very strange outside her bedroom window. A rogue vacuum, the Ulysses 2000x, is out of control in her neighbor's backyard and vacuums up an unassuming squirrel. Not sure if the squirrel is alive or dead, Flora runs down the stairs and out of her house to try to rescue him from his prison, and is compelled to perform CPR on the unresponsive critter. What happens next is nothing short of extraordinary. The squirrel, having been resuscitated by Flora, now seems to have special powers, and Flora is determined to use him to help try to rid the world of evil. Or something. All superheros, however, must have an arch-nemesis, and Flora, to her horror, discovers that her superhero friend's mortal enemy is her own mother. Armed with a band of unconventional sidekicks such as her neighbor Mrs. Tickham, along with Mrs. Tickham's temporarily blind great-nephew William Spiver (who prefers to be called William Spiver, thank you very much), and the philosophizing Dr. Meescham, Flora and Ulysses seek to "conquer villains, defend the defenseless, and protect the weak. Or something." 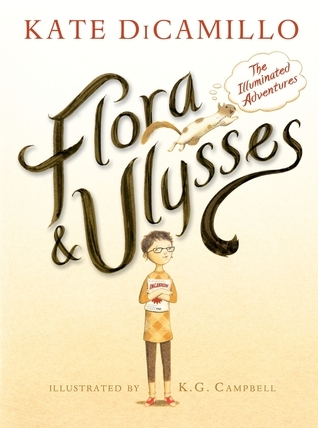 Flora & Ulysses is a kooky little book. At first, it can be hard to wade through the eccentricities to find a purpose other than just straight-up nonsense, but stick with it. Despite the head scratching that is sure to go on at the beginning of the novel, the writing is what keeps the reader amused and interested. The voice and cadence are quirky to say the least. But a little over halfway through, while the quirk continues, the heart and soul of the story finally begins to reveal itself. Kate DiCamillo's reaction to the news that she had won the 2014 Newbery medal for Flora & Ulysses through her tears was, "But it's a book about a squirrel!" Oh no dear Kate. This book is about so much more than a squirrel. This is a book about love and about melting even the most cynical of hearts, which in the end, was Ulysses' true superhero power. LOVE this book and love your last sentence!